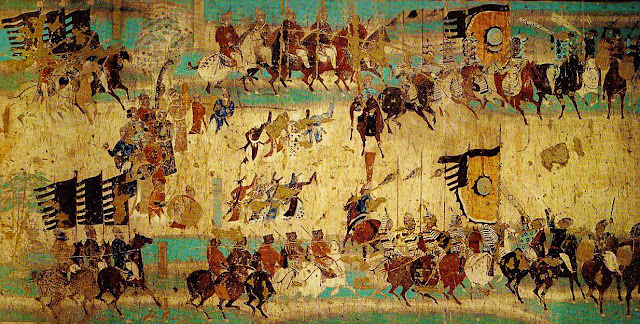 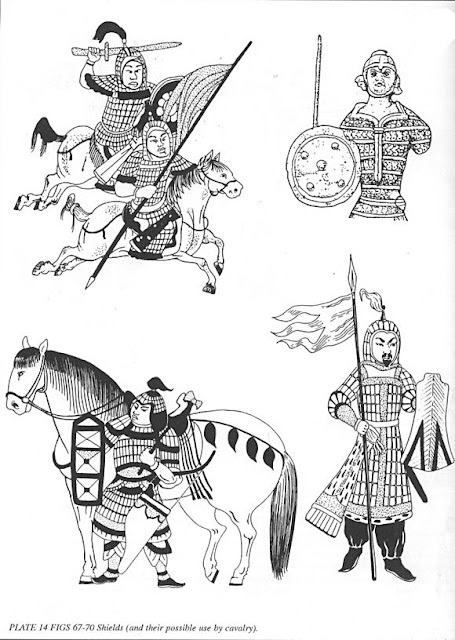 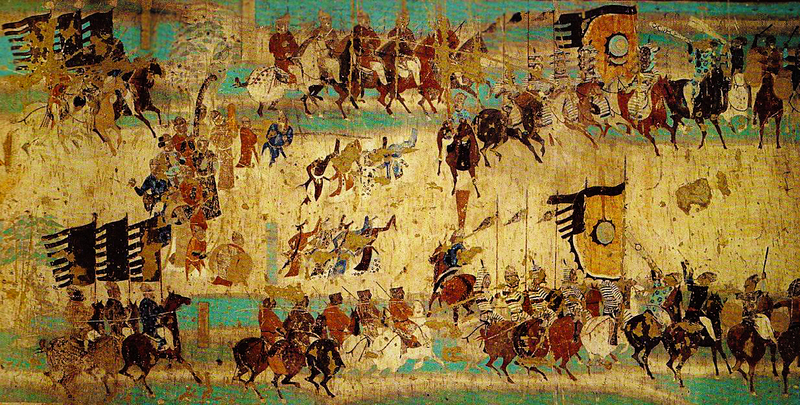 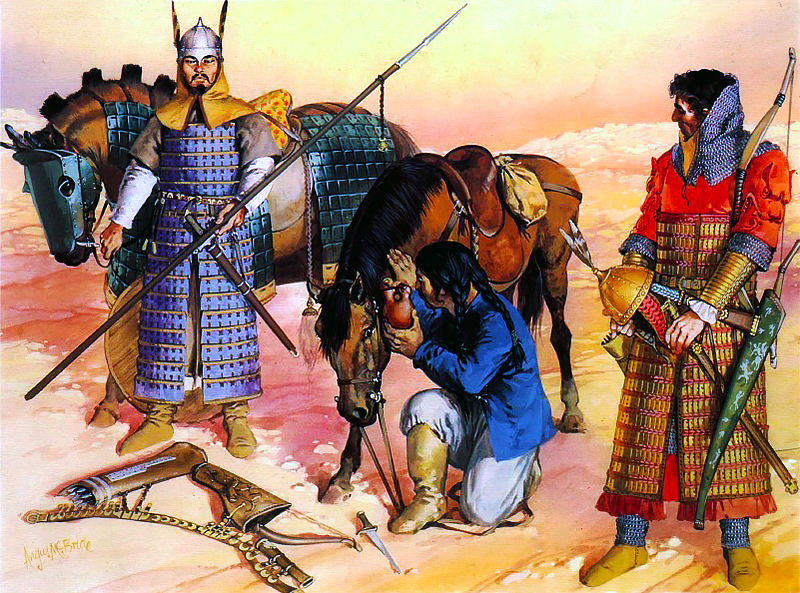 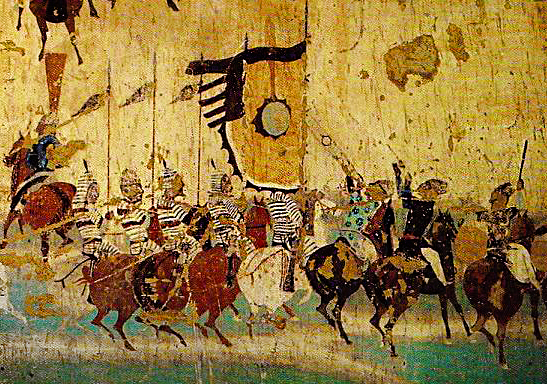 Various examples of Tang dynasty cavalry drawn from varous Tang paintings and historical artifacts, Lancers and ensigns are represented on the image above, The second image shows the various other weapons the cavalry typically carried~ such as their long lacquered shields, swords, and axes, which were all fielded by the cavalry as well. 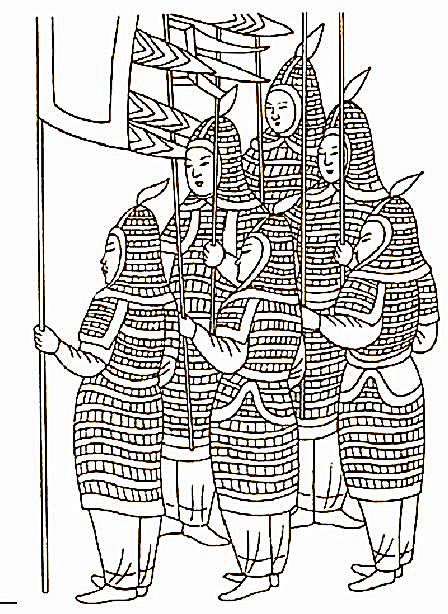 Cohorts of Tang guards in lamellar armor, as well as a medium Tang lancer and a heavy archer. 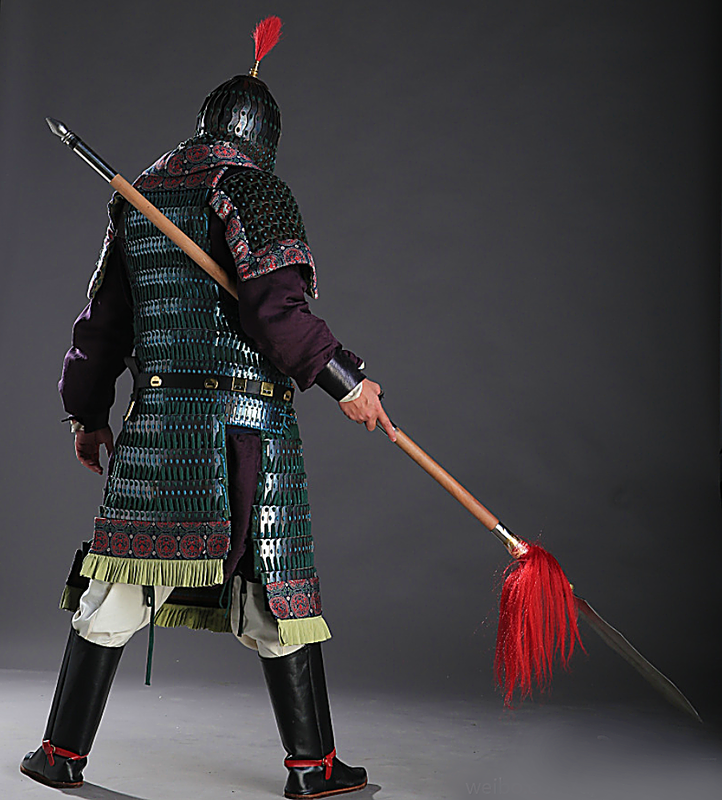 Right: Long skirt tail, connected by straps and belts. 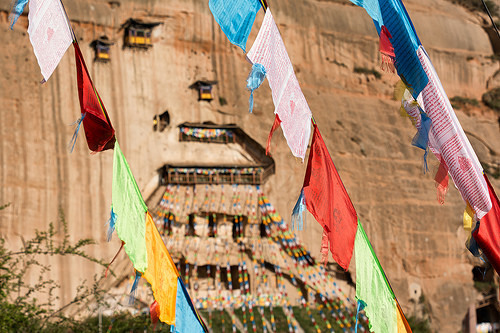 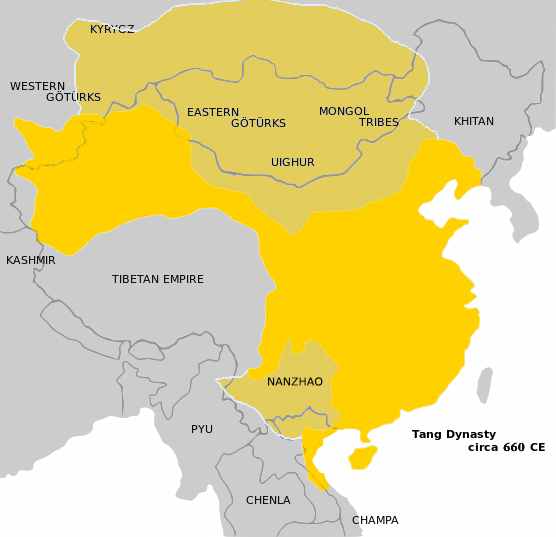 The former remained well in use in China until the Liao, Jin, and Yuan dynasties, while the later fell out of use in China by the end of Tang but still remained popular with the Mongols and the Tibetans. 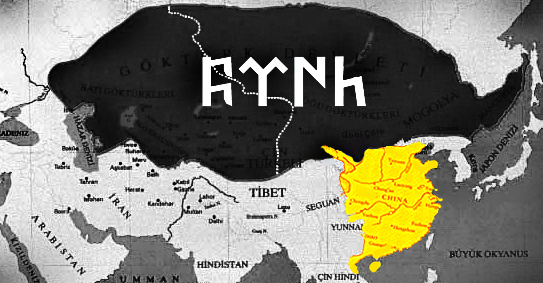 Turkic belt from the 7th century. 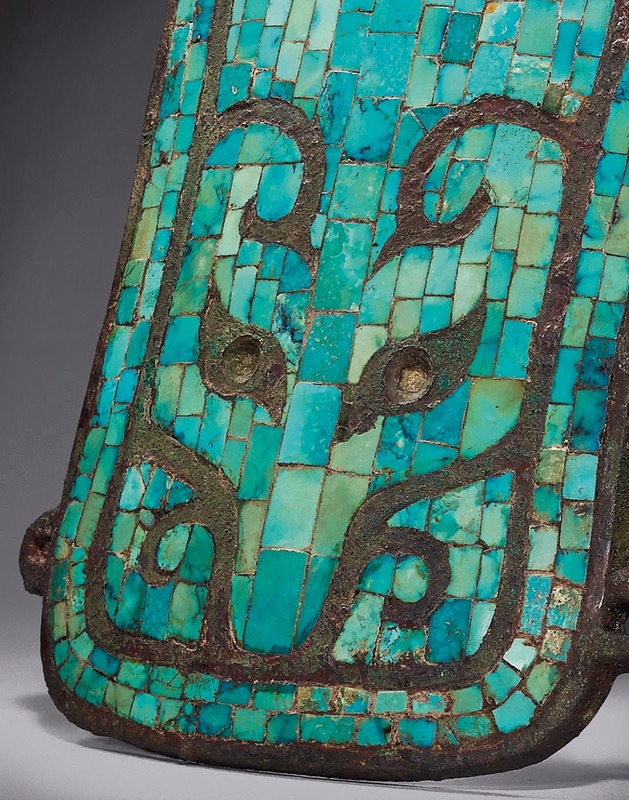 Most horse archers and heavy riders who fought on the steppes often worn these extremely elaborate belts bearing graceful curvilinear designs. 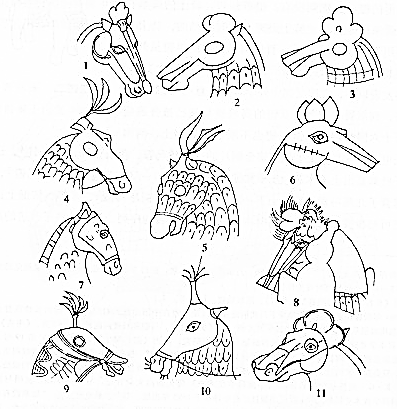 Various mystic animals, motifs of fowl and cunning mammals are carved in bronze or gold. 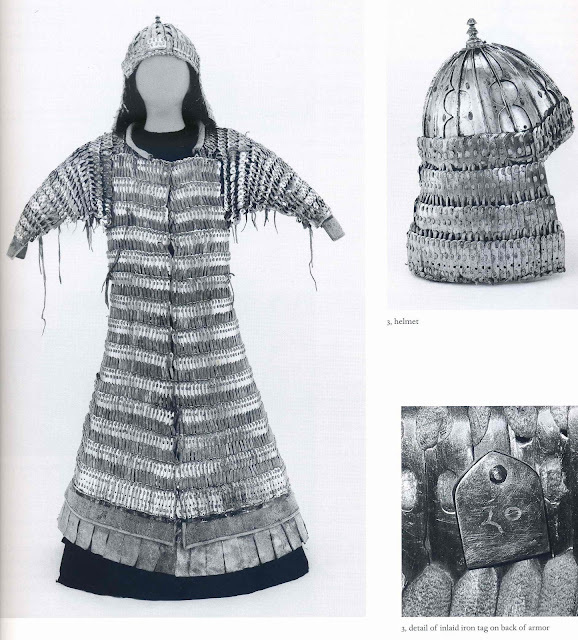 as Tang- Turkic- Tibetan armor from a millennia earlier. 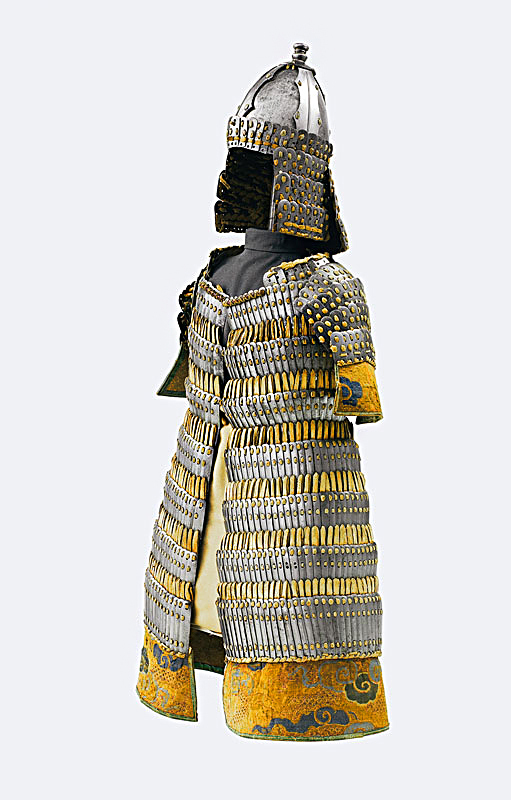 The coat opens down the length of its front, and the back of the skirt is split vertically from the bottom row up to the waist by two seams, one at either side. The armor would protect the wearer from blows from many directions. 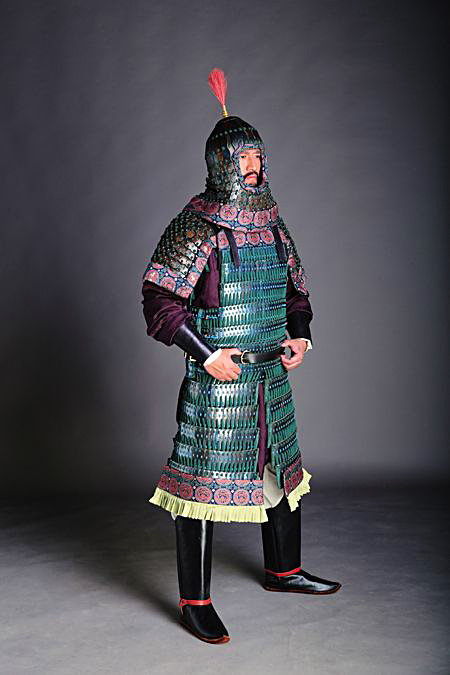 Most armors are sleeveless, but some have shoulder defenses formed of several rows of lamellae, but in later dynasties, the Liao and the Jin for example would incorporate full lamellar sleeves and a lamellar veil that covers all but the hands and the eyes of the wearer. 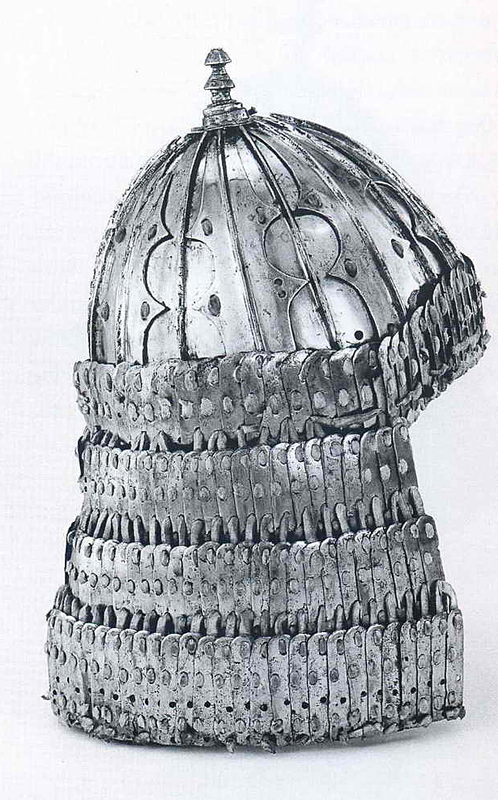 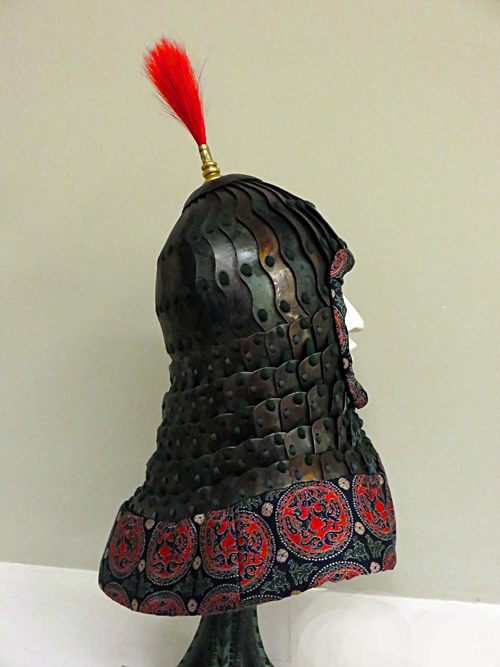 Reconstructed helmet used by the elite Tang cavalry. 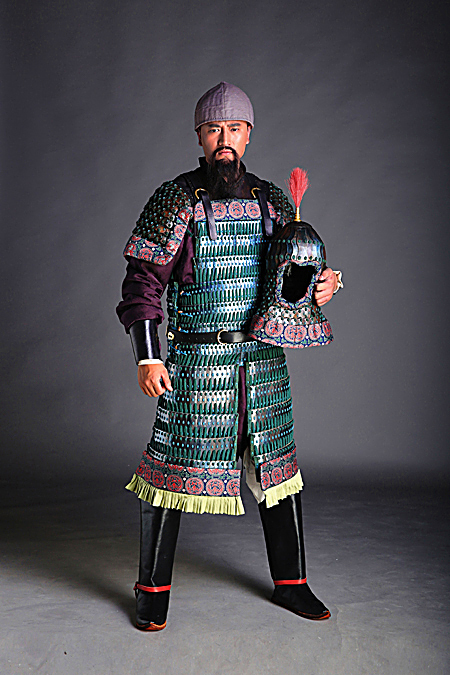 Though mostly similar in construction, from 8-32 lames (linked plates) the Tang cavalry helmet also included a neck guard that protected the wearer's exposed throat. 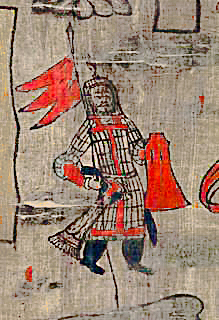 Tang cavalry man in full lamellar armor. 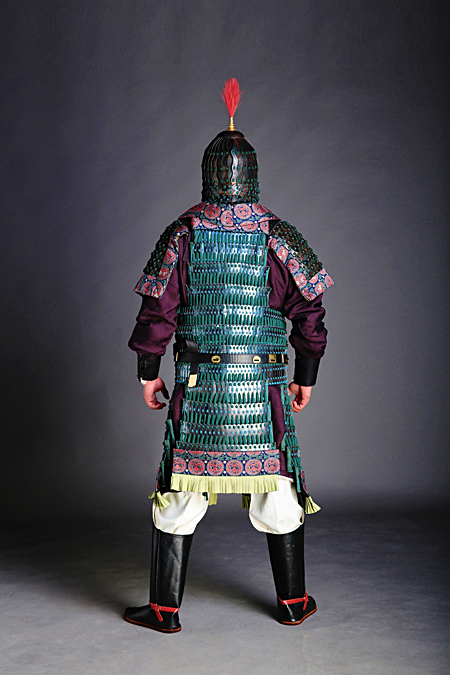 Lamellar aventail and pauldrons, bracers for the archers, and riding boots. 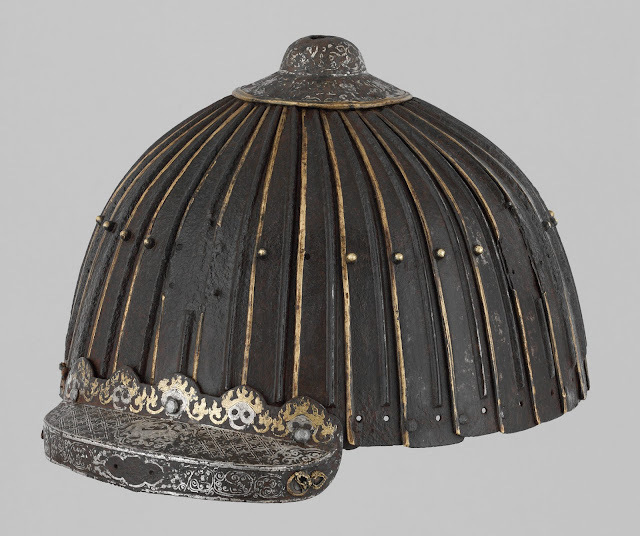 The plumes for the elite imperial guards would sometimes display elaborate peacock feathers or elaborate effigies of fowls with extended wings. 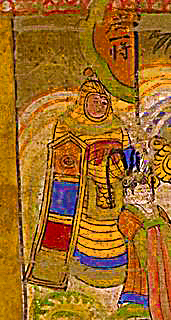 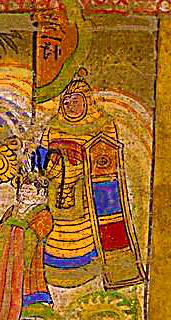 Tang Horseman in full lamellar armor, and lamellar armor for his horse. 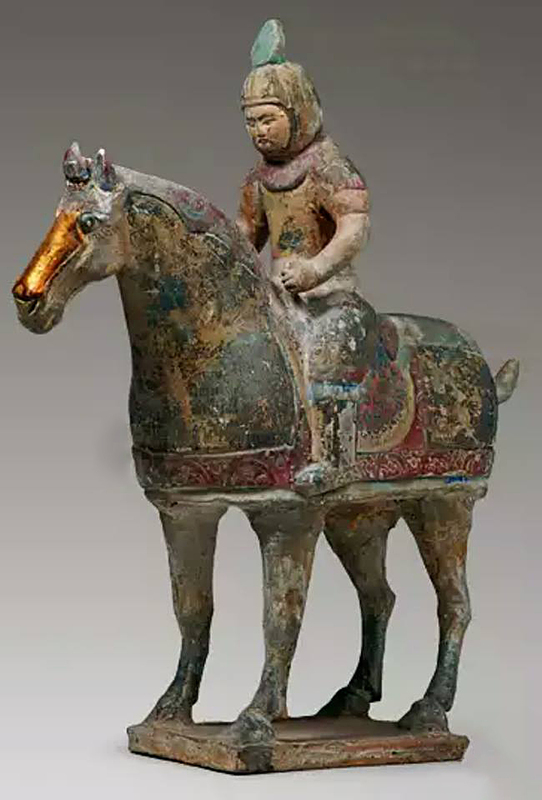 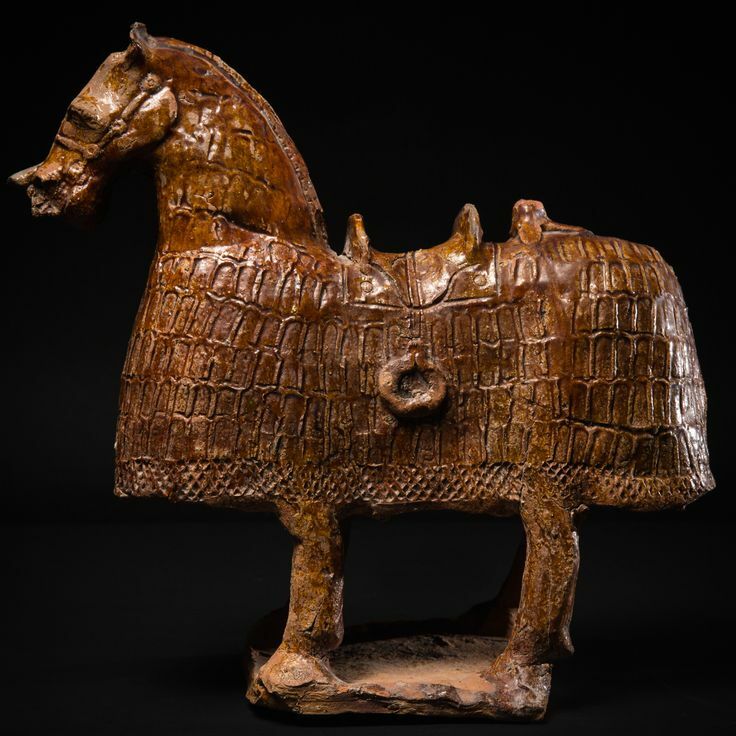 Armour for horses began to appear around the end of the Han dynasty, but the earliest armour yet found dates to the year 302 AD. During the Three Kingdoms period, fully armoured cavalry (armour covering both the rider and horse) were extensively used as shock troops. 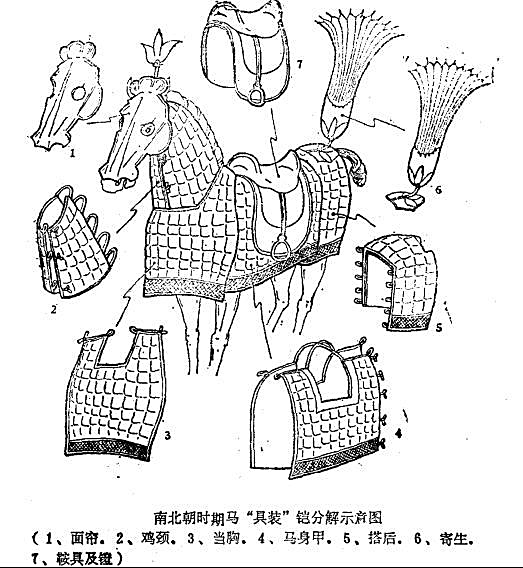 Early horse armour came in one piece, but later horse armour came in multiple pieces: chanfron (head protector); neck guards; chest guards; shoulder guards; flank pieces; and crupper. 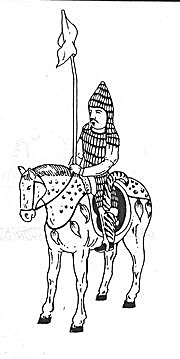 Most cavalry served as mounted archers, and sometimes removed their arm protection to use their bows or crossbows. 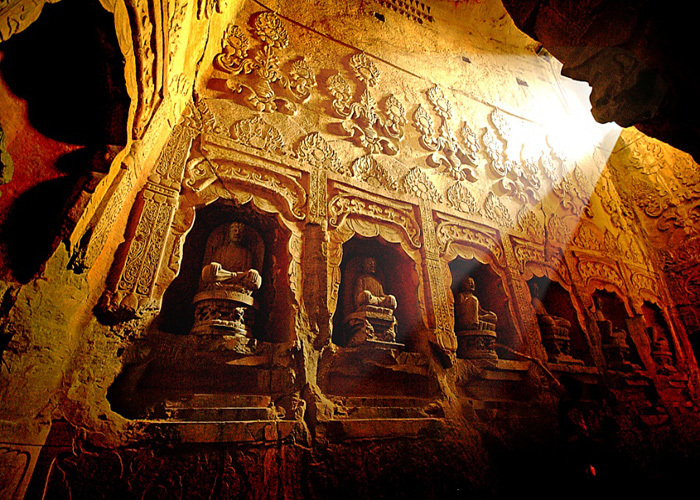 But by 4th century AD. 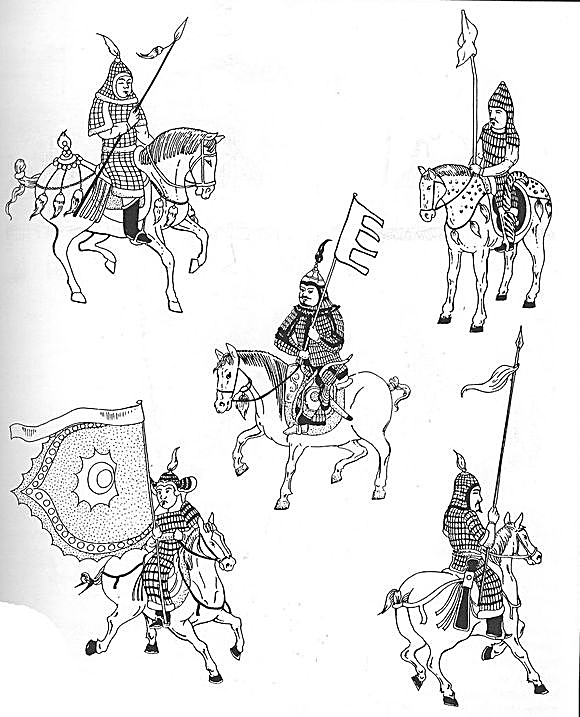 The Chinese adopted the extremely heavy shock cavalry tactics employed by steppe confederacies like the Xianbei and the Rouren. 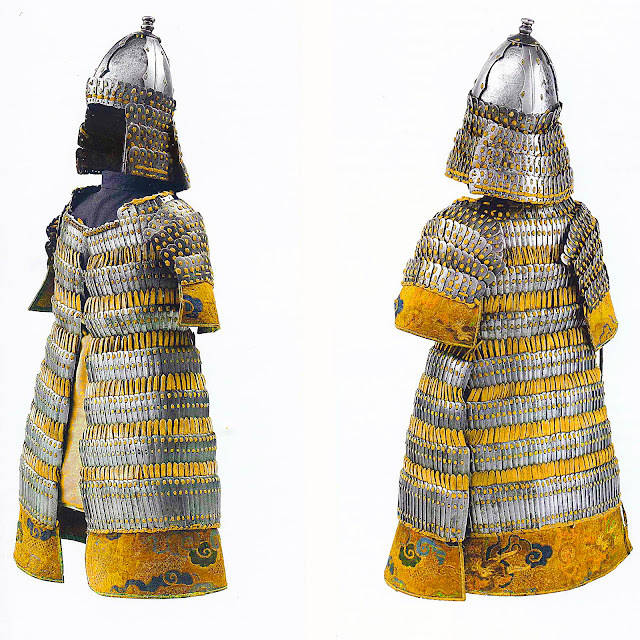 Since then, the Chinese polities fielded some of the heaviest cavalries of the world with full lamellar armor and thick plated chanfrons. In some cases, the horses were even more heavily armored than the riders themselves. 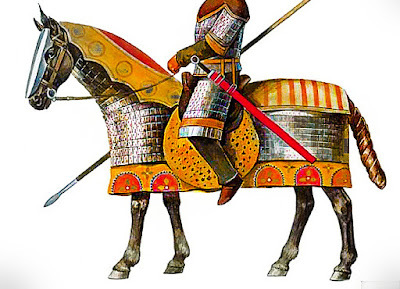 note the ostentatious plume on the horse's hip. 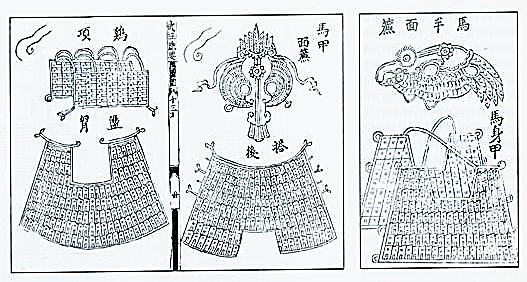 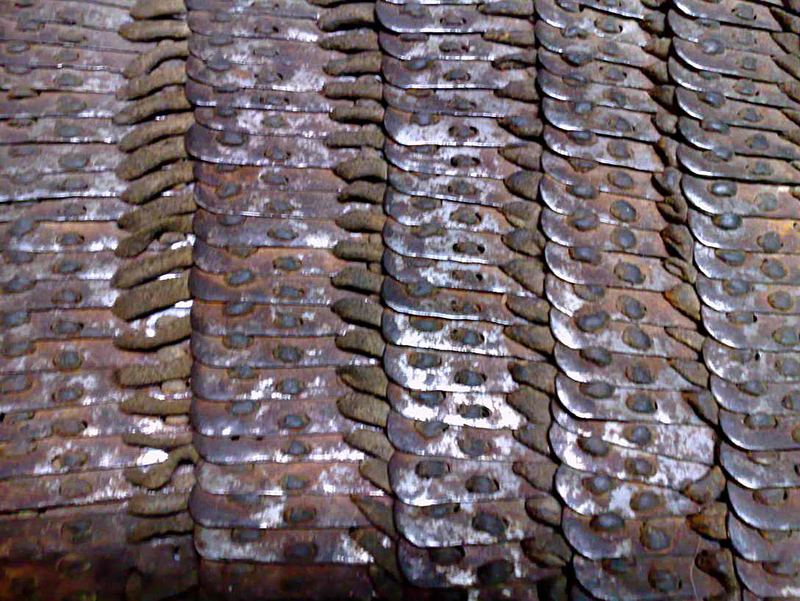 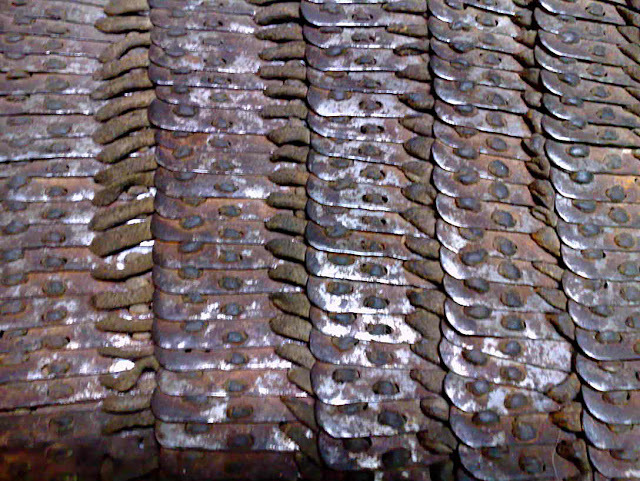 Tang barding~ showing multiple layers of reinforced padding. 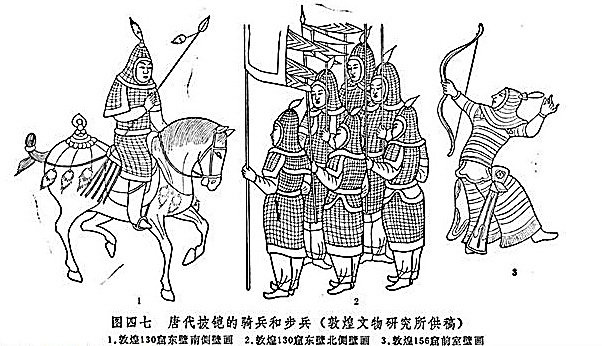 The rivals of the Tang Dynasty~ Above: 7th-8th century 突厥汗国 Gokturk champions in lamellar armor- intersected by a kneeling horse archer. 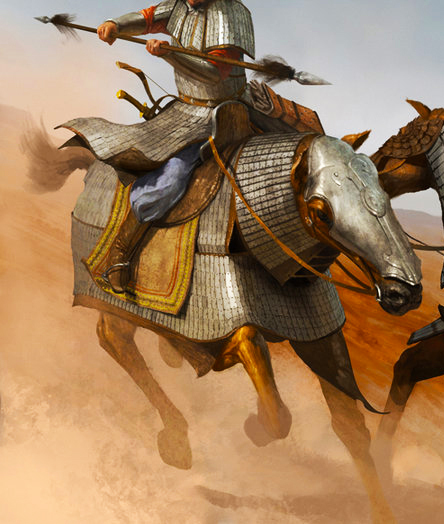 The main fighting strength of the Gokturks lies within their extremely mobile cavalry archers. 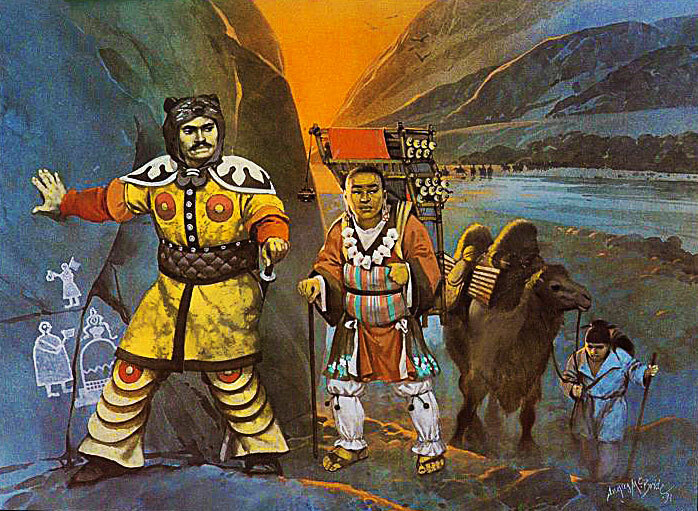 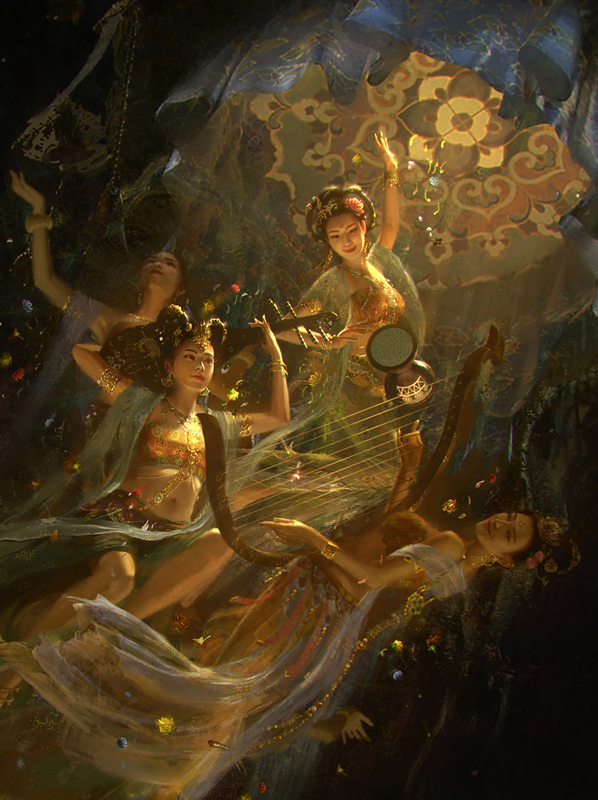 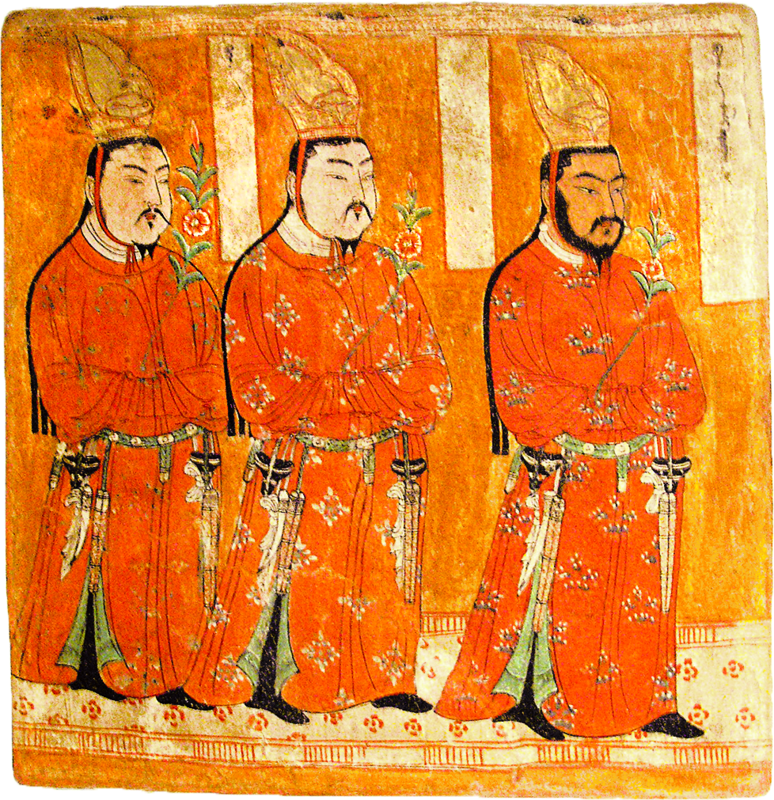 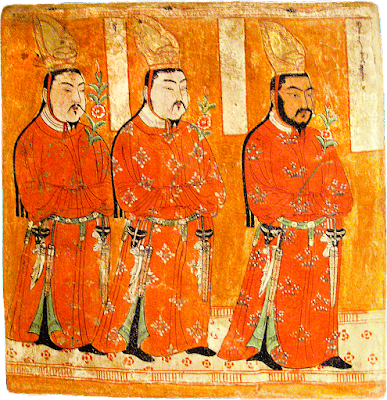 The second image represented the 回鶻 Uighurs allies of the Tang~ originally from Mongolia who were positioned to be in charge of much of the Tarm Basin in the 8th-9th century~ during which they served as Tang vassals in the former Tang region known as the 安西四鎮 Four Garrisons of Anxi. 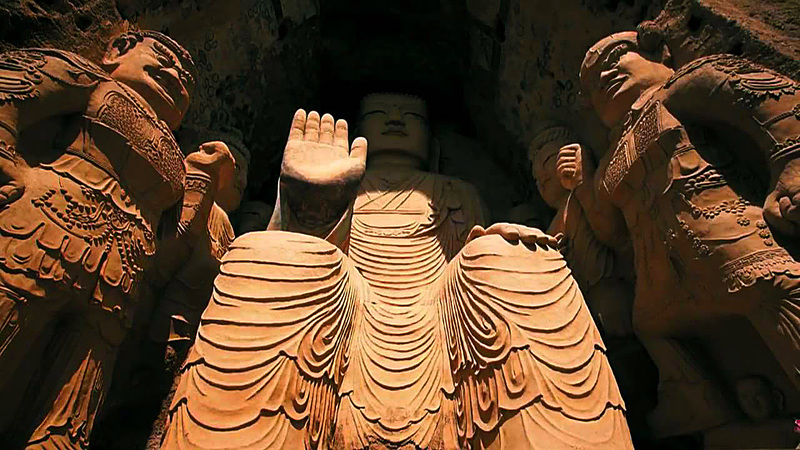 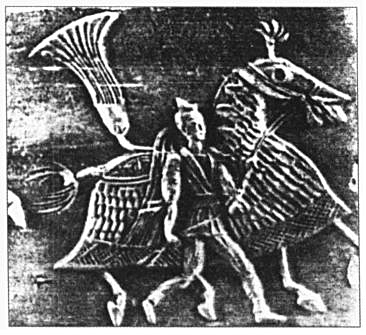 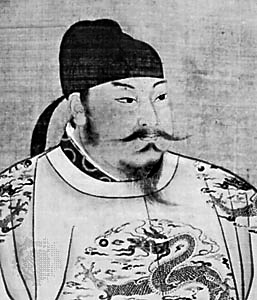 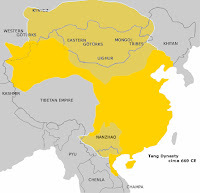 It should be noted that the Gokurk Empire predates and was concurent with the Tang, while the Uighurs appeared largely near the latter stages of the Tang dynasty~ from where they exerted greater control in the region. 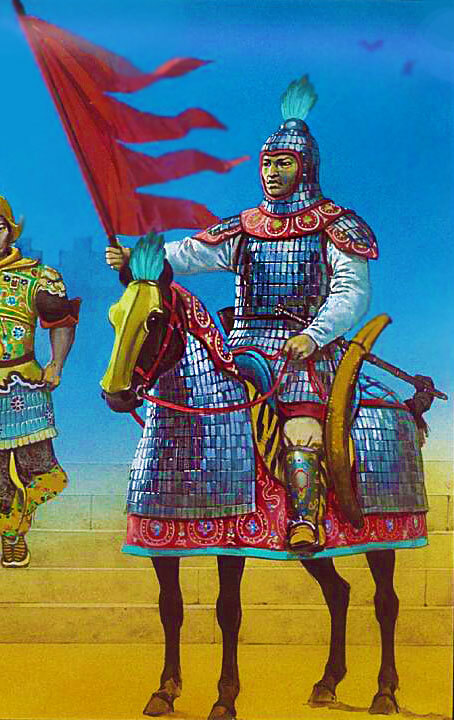 ~It should be also noted that at a large portion of many of such distinguished "Tang" cavalry divisions are themselves composed of Turks auxiliary and led by Turkic commanders. 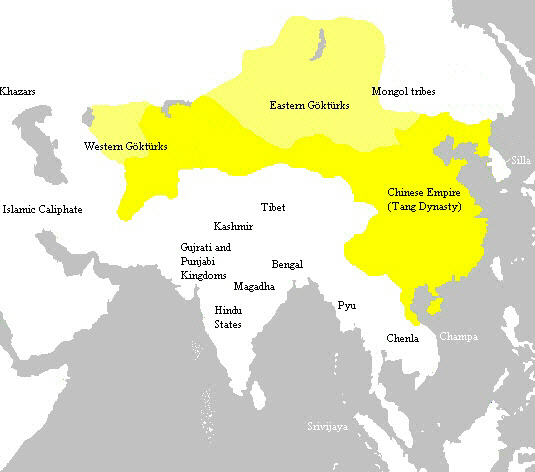 expansion of Turkic language and the advent of Islam in the Tarim Basin. 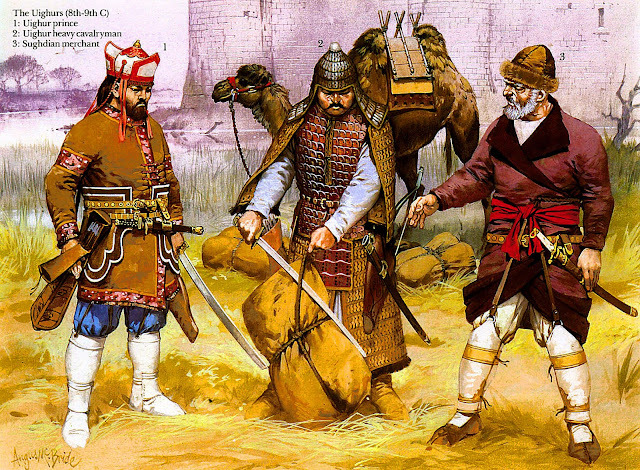 Central Asia absorbed much cultural influences from the conflict. Ironically, because the Turk's ancestors have actually originated from Modern Mongolia and had mostly operated there in the centuries before the conflict~ with the deployment of such vast Turkic communities as military garrisons and colonizers, this conflict actually began a billiard- ball effect of sending out Turkic Migrations that ultimately spilled the Turks into the Middle East. 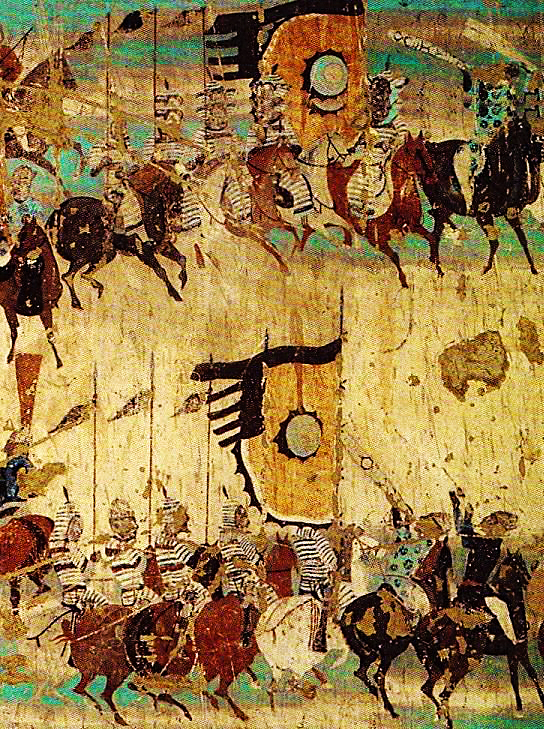 Through the breach of this natural membrane, which had formerly contained the Turks within the northern steppes, Turkic culture and language spread further into the deserts of Central Asia and would one day be exposed to the influence of Islam that would cause a genocidal civil war between rival Turkic princes that would fatally end Buddhism for all the Turkic powers in the region to be replaced by Islam. 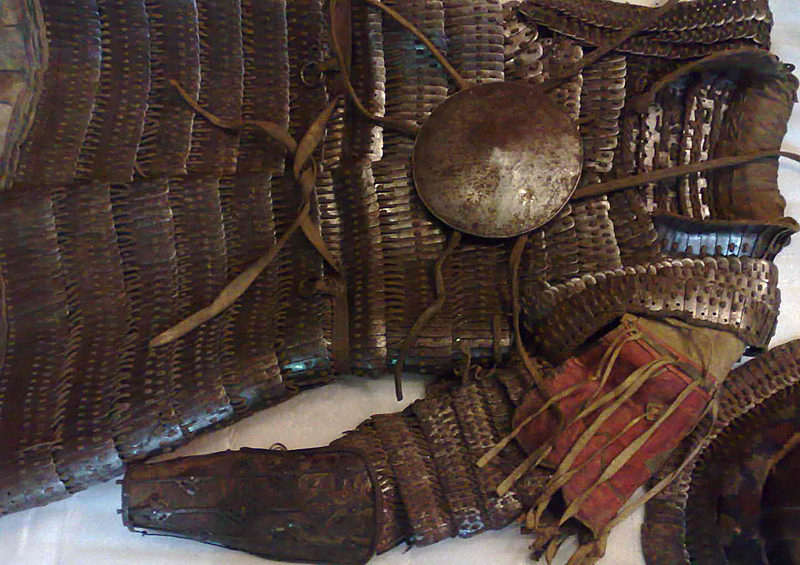 By which time the Tang had long disintegrated into a patchwork of warlord-governors. 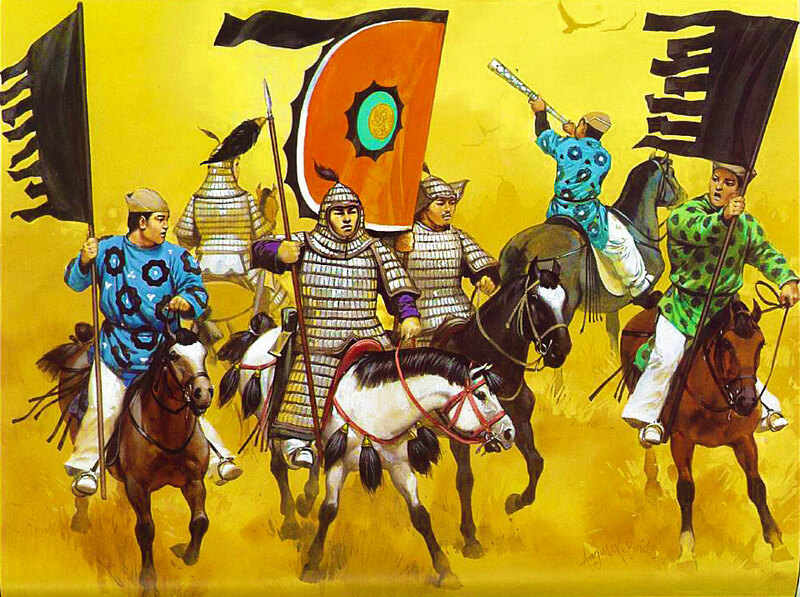 Which movie did you get the screenshots from (armies in armor with cavalry)? Lady of the Dynasty, it's an abysmal movie that's horribly historically inaccurate. 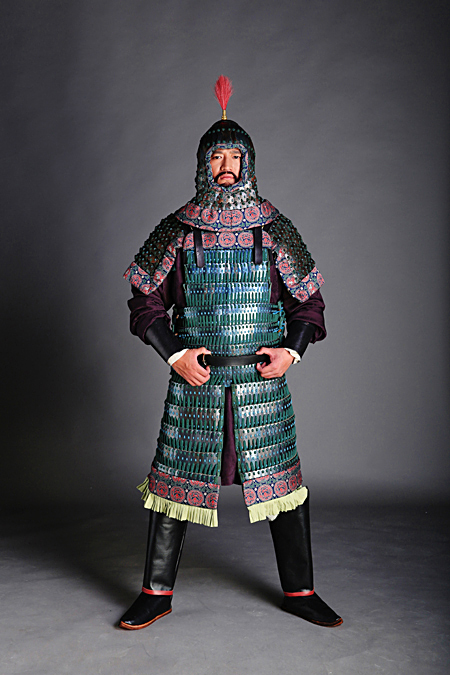 But has somewhat decent scenes with heavy Tang cavalry armor.